in the Materials sector as of January 22nd, 2014. Figure 1 ranks from best to worst the nine Materials ETFs that meet our liquidity standards and Figure 2 shows the five best and worst-rated Materials mutual funds. Not all Materials sector ETFs and mutual funds are created the same. The number of holdings varies widely (from 31 to 139), which creates drastically different investment implications and ratings. 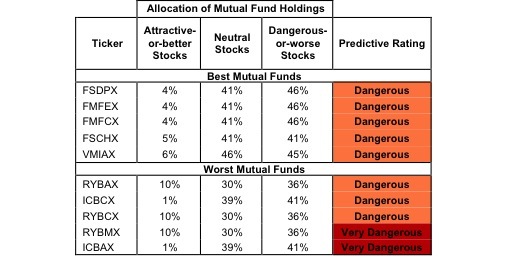 The best ETFs and mutual funds allocate more value to Attractive-or-better-rated stocks than the worst ETFs and mutual funds, which allocate too much value to Neutral-or-worse-rated stocks. To identify the best and avoid the worst ETFs and mutual funds within the Materials sector, investors need a predictive rating based on (1) stocks ratings of the holdings and (2) the all-in expenses of each ETF and mutual fund. Investors need not rely on backward-looking ratings. My fund rating methodology is detailed here. Investors should not buy any Materials ETFs or mutual funds because none get an Attractive-or-better rating. If you must have exposure to this sector, you should buy a basket of Attractive-or-better rated stocks and avoid paying undeserved fund fees. Active management has a long history of not paying off. PowerShares Dynamic Basic Materials (NYSEARCA:PYZ) and Fidelity MSCI Materials Index ETF (NYSEARCA:FMAT) are excluded from Figure 1 because their total net assets (TNA) are below $100 million and do not meet our liquidity standards. iShares North American Natural Resources ETF (NYSEARCA:IGE) is my top-rated Materials ETF and Fidelity Select Portfolios: Materials Portfolio (FSDPX) is my top-rated Materials mutual fund. Both earn my Dangerous rating. State Street SPDR S&P Metals & Mining ETF (NYSEARCA:XME) is my worst-rated Materials ETF and ICON Funds: ICON Materials Fund (ICBAX) is my worst-rated Materials mutual fund. XME earns my Dangerous rating while ICBAX earns my Very Dangerous rating. 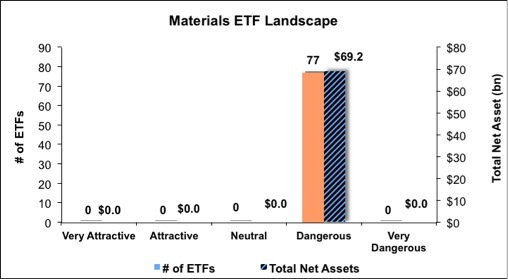 Figure 3 shows that 15 out of the 226 stocks (over 7% of the market value) in Materials ETFs and mutual funds get an Attractive-or-better rating. However, no Materials sector ETFs or mutual funds get an Attractive-or-better rating. The takeaways are: mutual fund managers allocate too much capital to low-quality stocks and Materials ETFs hold poor quality stocks. As detailed in “Cheap Funds Dupe Investors”, the fund industry offers many cheap funds but very few funds with high-quality stocks, or with what I call good portfolio management. Investors need to tread carefully when considering Materials ETFs and mutual funds, as no ETFs or mutual funds in the Materials sector allocate enough value to Attractive-or-better-rated stocks to earn an Attractive rating. Investors would be better off by focusing on individual stocks instead. CF Industries Holdings, Inc. (NYSE:CF) is one of my favorite stocks held by Materials ETFs and mutual funds and earns my Very Attractive rating. It is also one of my Most Attractive Stocks for January. CF has increased after-tax profit (NOPAT) by 37% compounded annually over the last five years and generates a top-quintile 27% return on invested capital (ROIC). CF has also increased economic earnings by 34% compounded annually over the last five years. Despite this rapid profit growth, the stock is cheaply-valued. At its current trading price of ~$247/share, CF has a price-to-economic book value (PEBV) ratio of 0.65. This valuation implies that the market expects NOPAT to decline permanently by 35%. For a company with such a strong track record of growth and profitability, this outlook seems overly pessimistic. The hurt from declining nitrogen prices is already more than priced into the stock. Strong growth and low expectations make CF an attractive pick for investors. The Dow Chemical Company (NYSE:DOW) is one of my least favorite stocks held by Materials ETFs and mutual funds and earns my Dangerous rating. The DOW Chemical Company has realized a decline in NOPAT of 6% compounded annually over the last seven years, including a 27% decrease between 2011 and 2012. The company’s return on invested capital (ROIC) has also declined from 13% in 2005 to 5% in 2012, resulting in negative economic earnings over the last seven years. Worse yet, DOW is highly over-valued. To justify its current trading price of ~$46/share, The DOW Chemical Company would have to grow NOPAT by 16% compounded annually for the next 12 years. Turnaround stocks usually carry quite a bit of risk, but at its current price DOW has very little upside as well. High risk and low reward means that investors should steer clear of DOW. 138 stocks of the 3000+ I cover are classified as Materials stocks, but due to style drift, Materials ETFs and mutual funds hold 226 stocks. 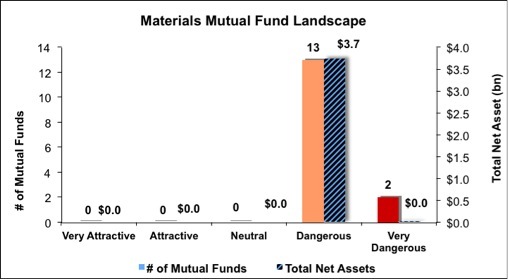 Figures 4 and 5 show the rating landscape of all Materials ETFs and mutual funds. My Sector Rankings for ETFs and Mutual Funds report ranks all sectors and highlights those that offer the best investments. Review my full list of ratings and rankings along with reports on all 11 ETFs and 15 mutual funds in the Materials sector. Jared Melnyk contributed to this report. Disclosure: David Trainer owns CF. David Trainer and Jared Melnyk receive no compensation to write about any specific stock, sector or theme.